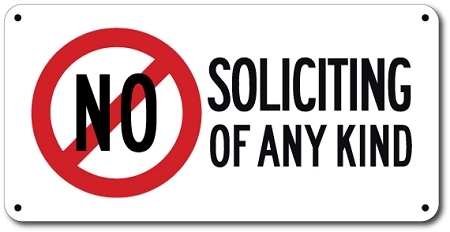 6" X 12" Aluminum No Soliciting of Any Kind Sign with No Symbol. A Direct Message Delivers a Strong Command to Would Be Solicitors. Keep Solicitors Away with Our Bold and Easy to Read and Understand Sign. Covers Any Type of Solicitations!